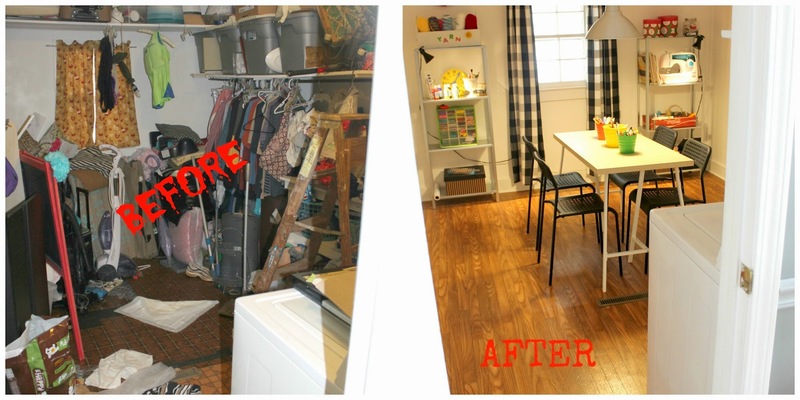 Well, I promised that I would reveal our laundry room make-over, but boy this has me quivering in my boots! This post should come with it's own disclaimer: "view only at your own risk!". I have to say first before any photos, that ALL the other rooms in our house are super clean, REALLY! I'm going to totally humiliate my family by posting the before photo, but I just love before and after photos on blogs that I follow, so, I'm throwing my shame under the bus! Our "laundry room", was a storage and catch ALL room for years. It was like a giant junk drawer. It stored everything from suitcases to pet food and EVERYTHING in between. This room is directly off of our dining room, and as often as I entertain, I was mortified if one of my kids would open the door while company was over in fear that they would see my terrible secret. I, clean freak Mama, had a very messy, yucky, hoarder-like room in my home. I don't know why we didn't tackle this room sooner. This room has been the most fun of any of the home projects we have done, probably because it is such a dramatic change. We began by purging lots! We had a giant garage sale and donated some items to local charities. We moved other items to storage bins in the basement. We then removed the shelves to open the room up, and it really did! We put on a coat of fresh white paint, scrubbed the window and laid a new vinyl floor. Then the fun started with decorating, and we still have lots that we want to add, but this is a great start. Now staying organized is a snap. Before, we could hardly find the washer and dryer, but now everything has a place. The room is multi-purpose. It serves as a laundry, mudroom, craft and sewing room. Even our 15 year old washer and dryer got a fresh coat of paint, 'cause that's just how thrifty we are, if it's not broken, it's not getting replaced. This project didn't happen overnight either. We started purging last fall, and the week after Christmas, friends helped to lay the vinyl floor. Then a month later the paint, and I think you get the picture. When you're working on a shoestring budget, it can take a while, but some progress is better than no progress. I finally have a place for my sewing supplies and my machine, instead of being stored on a top shelf of a closet when not in use, it is now within easy reach. And finally, I'm no longer embarrassed when friends are gathered in the dining area. It's a wonderful, well organized space. This makeover seemed like such an overwhelming task that we put it off forever. I could just kick myself for that. We spend so much time in this room now and before it was cringe-worthy. Also, laundry has yet to get behind, because the room is so cheerful and pleasant, we all get our laundry done. Thanks for stopping by to view our laundry room redo. Holy smokes that's a HUGE difference! The room looks so big and bright now. You did a fabulous job. Thanks for sharing the transformation on Merry Mondays. Thank you so much Carrie and what an honor to be featured! That is truly an awesome re-do. My laundry/mudroom/storage room is horrendous. I start re-org and my guys trash it before I'm finished ! Our room is maybe 1/2 the size of yours, with 4 doors. It's in the breezeway between the kitchen and garage. It also has 2 windows so it's a big challenge. My goal is to find a place I can have my sewing machine in another multipurpose room (including home to 3 large vari-kennels for our three 50 lb dogs. That's a lot of space. Way too much in the room. What can I say. Hubs hoards furniture. Janet, thanks for the comment. I, too, have a "collector" for a husband, and it is challenging! Even with a really small space, there is hope! Sometimes with a multi-purpose room like ours, you do have to think outside the box a little. Send me some photos one day and we'll both put our heads to thinking out a strategy that would work for your space. Have a wonderful weekend! Love how this space is for the kids as well as the laundry. Such a great size room love what you did with it!